A most amazing tool and option bringing our world closer together. Making contact with other people around the world, with different languages and culture. Humanization is the ultimate goal for peace and happiness in our modern World. I took strong faith in this to be happened. Please try this out and open your mind towards an peaceful, harmonizing world. Get out and reach others, not only for business purposes. The privat side of live is important too. Watch this amazing Preview Video from Microsoft. Translating Voice on the fly with Skype Translator is the correct way in doing so. We need to patch all the databases, and the LIS / XDS from CMS. First we remember, the Standard Edition has its own local SQL Server containing all databases necessary for its related Frontend Services, therefore a single command similar as for the SQL Backends is required. If you have an Enterprise setup, you need to identify which features are installed, e.g. only native or incl. Archiving/ Monitoring, or even Persistent Chat. This separated databases require their own commands. For the entire process based on Enterprise Deployment, please enumerate your Topology and identify the configured components. today is time that I will explain the Lync protocol short cuts, the name what actually this couple of letters mean. I was very often asked what e.g. is the meaning of STUN or RT. Also, which RFC is behind this protocol. If further information are available, I have posted this info too. This is protocol used on the Edge server, where UDP data is passed through the NAT. It contains information about the external (public) IP address where the client is hidden behind and the internal (private) IP address the client has assigned. Finally it is time to announce the changes Microsoft made. Still a lot feature are not yet public, but the name and the look and feel of the new client. A lot of rumors ran around the last month and now we have a huge discussion if this name could be the right one. YES, I say it is the right name, it is the right way Microsoft is going. Nothing is more efficient for a company, if user are familiar with the tools they need to master within the company. And here it come. over 20m people use Skype today and yes, they are very familiar with this tool. This means to us, the unified communication is now taking place in the real world. Families and their members come closer together. We increase the social component in our work environments. Never forget how amazing this is, chatting with your parents over the same tool. Even if this are two different platforms. Consumer (Skype) and Business (Skype for Business). thanks you for your participiation in my TechED 2014 session in Barcelona. I'm very proud you listen and enjoyed the session. After installation another Lync Frontend Server, in this case a SBS. The Federation was broken. Incoming via the Edge Server everything looked fine. Meaning, incoming Federation request, e.g. presence or IM, as well as remote access from users hosted on this SBS were working correctly. But all outing communication to federated partners didn't work at all. coming along with another message: winsock-info="The peer forced closure of the connection"
I used the RUST tool internally verifying the SBS certificate, it was correct. Even requesting the certificate again didn't help at all. Even I imported the Topology on the Edge server again! Error: The given key was not present in dictionary. Error: An error occurred when attempting to add "computer" to "RTCGroupxxx"
WebServer:pool.<fqdn> execution failed on an unrecoverable error. Error: Cannot obtain the domain information for computer "Root DC fqdn". Please make sure the computer FQDN is correct. Error: DsRoleGetPrimaryDomainInfromation failed with error "6BA". Just missing are the requirements for Topology publishing. Lync is quiet strict in certificate validation. 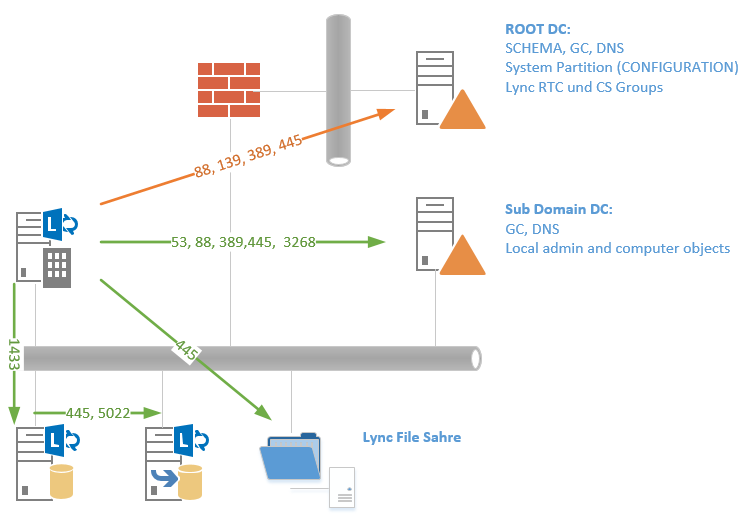 If you assign a non compatible certificate to Lync it will run into serious issues. This is most likely happen if you are using dedicated certificate for each Lync service. Especially the Lync WebServiceInternal certificate cannot be requested correctly, neither with Lync Wizard nor with the Request-CsCertificate command. Here the problem is that both methods are requesting a certificate with a Subject Name of the Internal Web Services rather than the POOL FQDN. In both, the TechNet and Help File the correct certificate is described. Therefore you need a valide process of requesting the correct certificate. If you have a consolidated certificate for all services, this is issue is not present, because the Subject Name responds to the POOL FQDN.